Okay, so it's been awhile. Life caught up with me and passed me by but I'm trying to get back into control again. I've managed to get the twins half-way through first grade so maybe it will be smoother sailing for awhile. I've just started taking a brand new on-line class from Mary Ann Moss of Dispatch from LA. 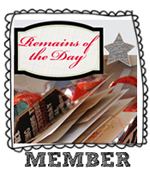 The class is called "Remains of the Day" and it is journal-making at its finest with paper, fabric, stitching, ephemera, etc. Mary Ann is a great teacher. I have taken two other classes with her and I really enjoy her style and quirky sense of humor. Hopefully I will get around to posting some of the works in progress from her previous classes that I took in the summer. Our first assignment involved making a scrappy cover for our new soon-to-be-made journals. I used a piece of home decorating fabric that I had overdyed as my cover base fabric and I machine appliqued tapestry, silks and other fabrics to it to make a scrappy chic looking cover. I even made a tie closure with tapestry fabric and several different types of yarns. Then I free motion stitched over parts with fuchsia rayon thread. YUMMY! Here are some pictures but the colors are a bit washed out. I took these in artificial light.